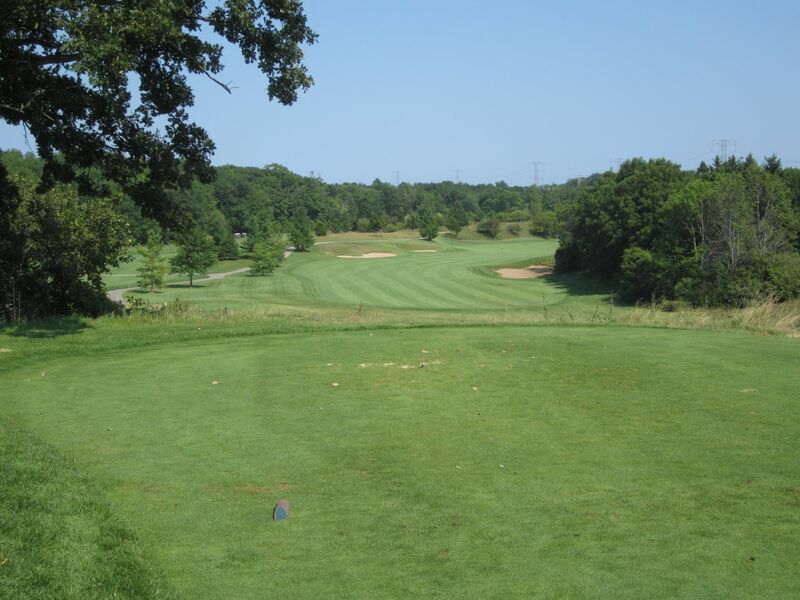 Designed by Jack Nicklaus and widely regarded as one of the top five golf courses in Wisconsin, and top 100 in the nation, The Bull is a beautiful and unrelenting championship course. Spread out over 400-plus acres of former farm land, The Bull beautifully incorporates the Onion River, dense forest, rolling hills, deep ravines, large ponds and significant elevation changes. The course rolls out one signature hole after another – all different, and all working harmoniously to create a finished product that collectively looks and feels like a true masterpiece. Mercifully, the course offers four sets of men’s tees that range from 6,027 yards (white tees) to 7,354 yards (black tees). 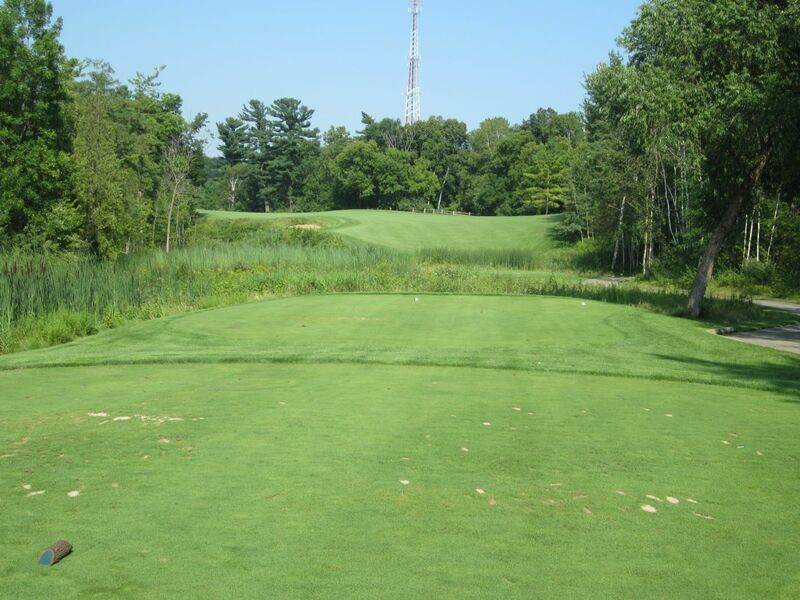 With a maximum slope of 147, this is a great course to abide by the recommended tee boxes. As a 13-handicap, I played the green tees (6,424 yards) on Saturday, and was happy with my choice. I have played from both the blues and blacks in the past, and struggled mightily. 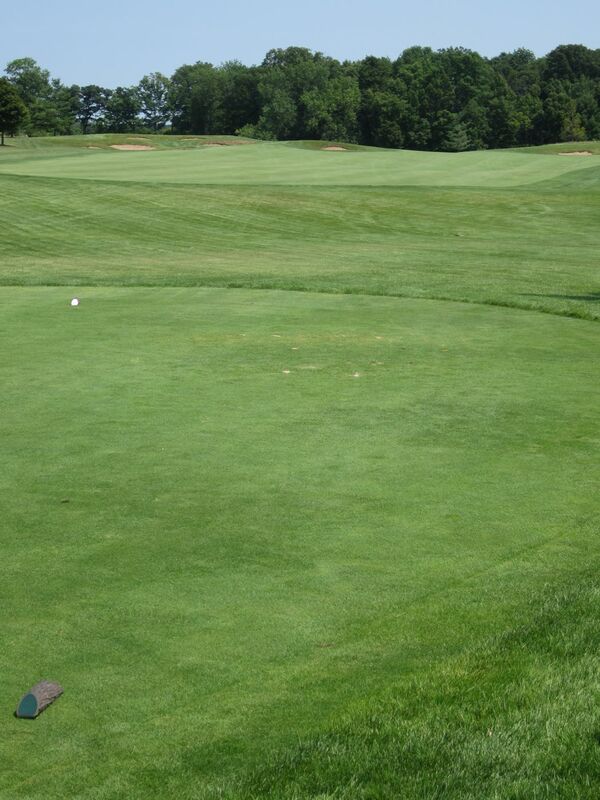 Most holes are isolated well from the rest of the course, giving the feeling that you are the only one out there. On a late November day, I almost was. I loved it. A persistent mist and light rain fell all day, but did not make for difficult playing conditions with the exception of using every glove in my bag. I mention this because the course is far more aesthetically pleasing than my pictures show. In fact, I am already planning on re-shooting the course next season when I will not have left my digital camera in my desk at work, then also forgot to fully recharge the battery for my backup. My smart phone was my only option, and does not do the course justice. The first hole at The Bull is a mid-length par four that finishes uphill. This hole contains one of the only out-of-bounds areas on the course – anything over the picket fence running along the right side is unplayable. 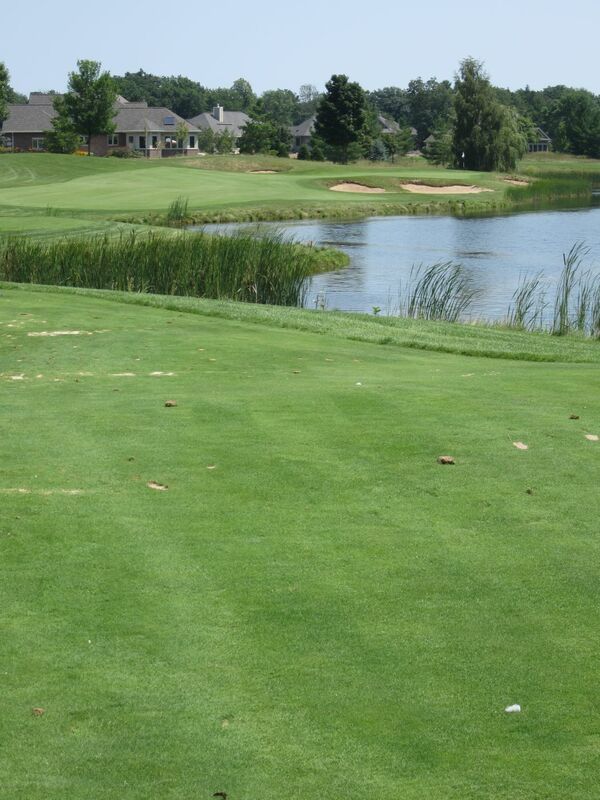 Every other area of the course can be played from, as long as the ball can be found. The front-right sand trap on the first hole is the biggest hazard to avoid, so keep the drive left and away from the fairway bunkers for the best opportunity for par on this opening hole. 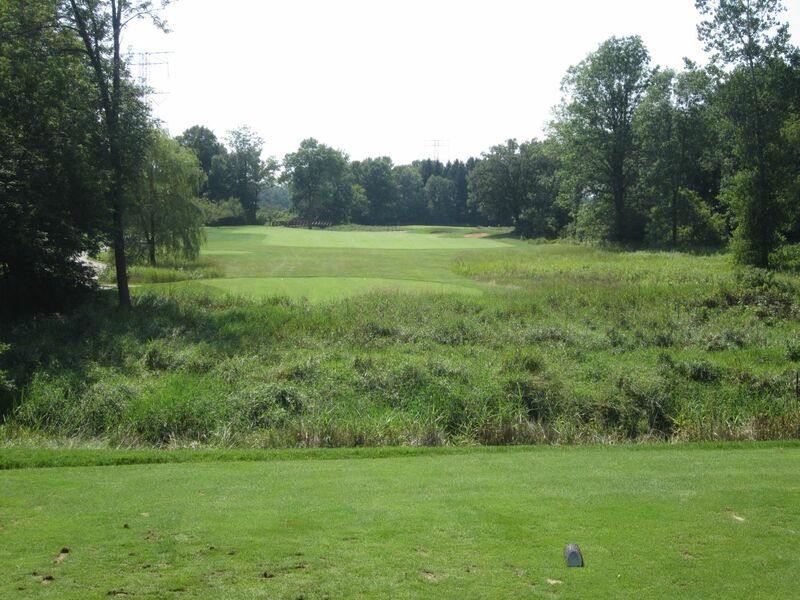 The second tees off over a lake that creates a natural dogleg right and runs the majority of the fairway. Bunkers surrounding the green make precision here a must. The third is a gorgeous par three that reminds me slightly of the fourth hole on the River Course at Blackwolf Run (nicknamed “Swan Lake”). Less than three miles away, the two courses are certainly comparable in many ways – a true credit to both venues. 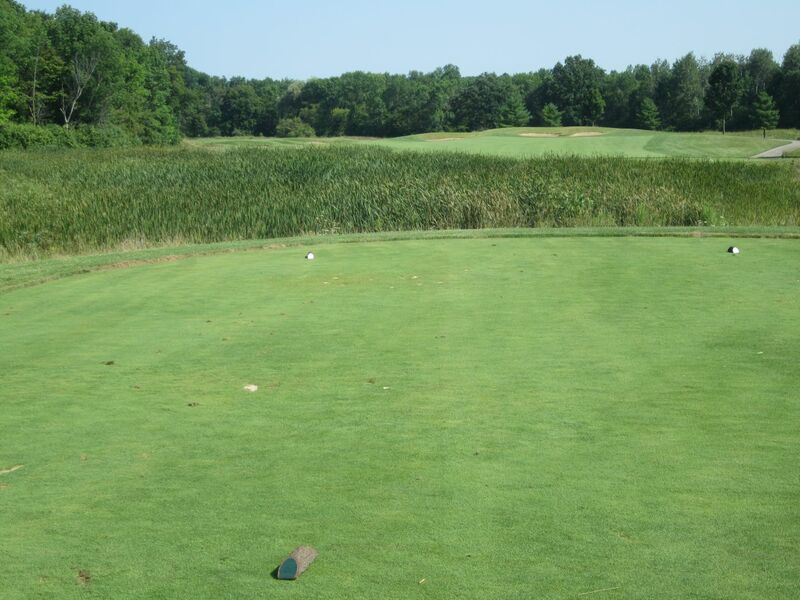 With water along the entire right side of the hole, the tee shot can play from as long as 214 yards from the black tees, and can only be bailed out left or short. 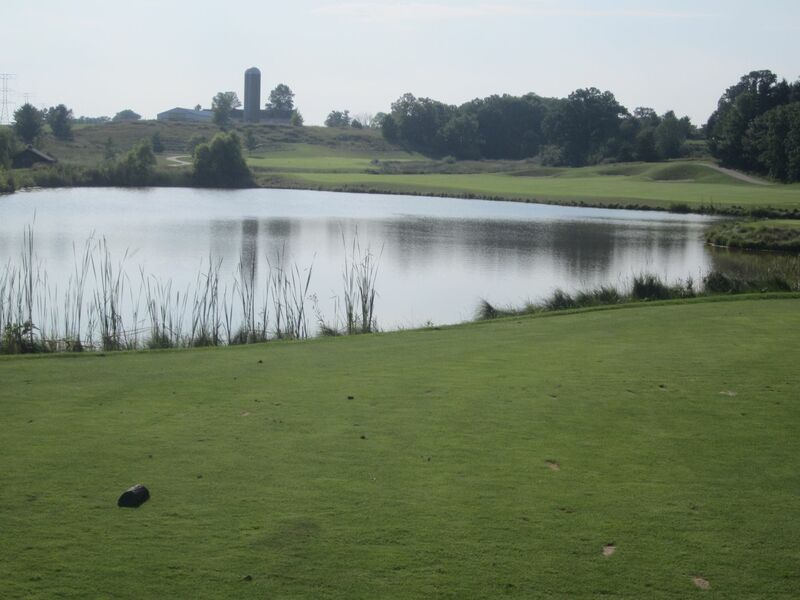 What The Bull does better than almost any Wisconsin course is par fives. The fourth is the first of the par fives here, and is my least favorite of the four. This actually implies nothing about the quality of the hole, as the other three are among the best I have seen. At under 500 yards from three of the tee boxes, the fourth is a short par five that plays over the left-side fairway bunkers. 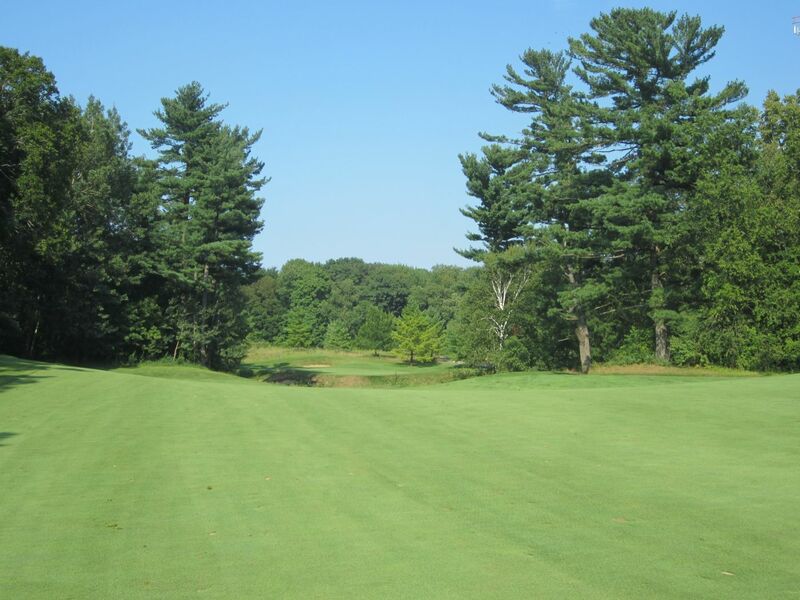 Woods narrows the playing area near the green, making for a challenging approach. This hole is certainly reachable in two. 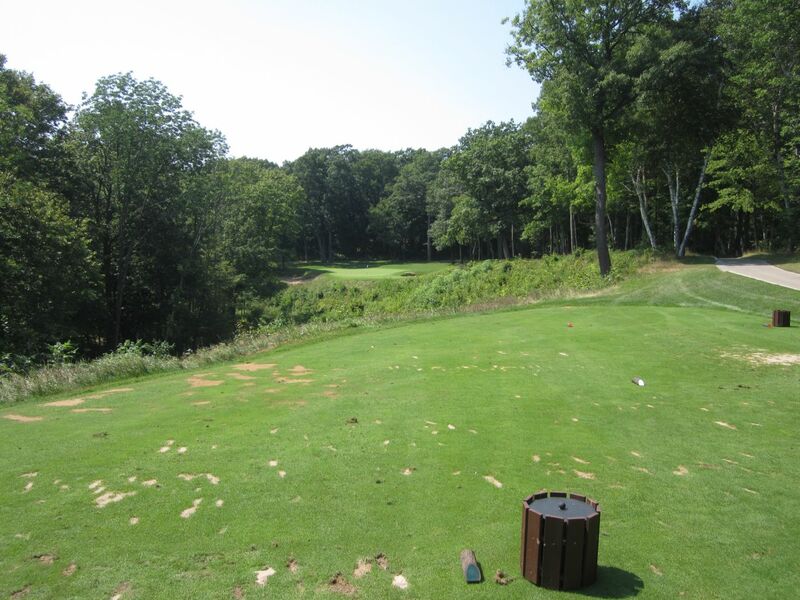 The fifth hole at The Bull is one of my all-time favorites, and one of the best golf holes in Wisconsin. 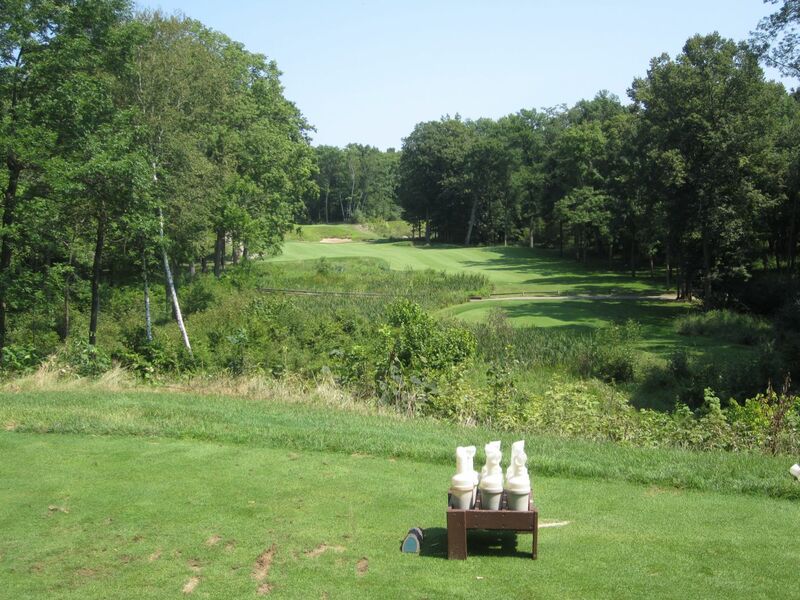 Nicknamed “Follow On,” the fifth features one of the most intimidating par four tee shots in the state. 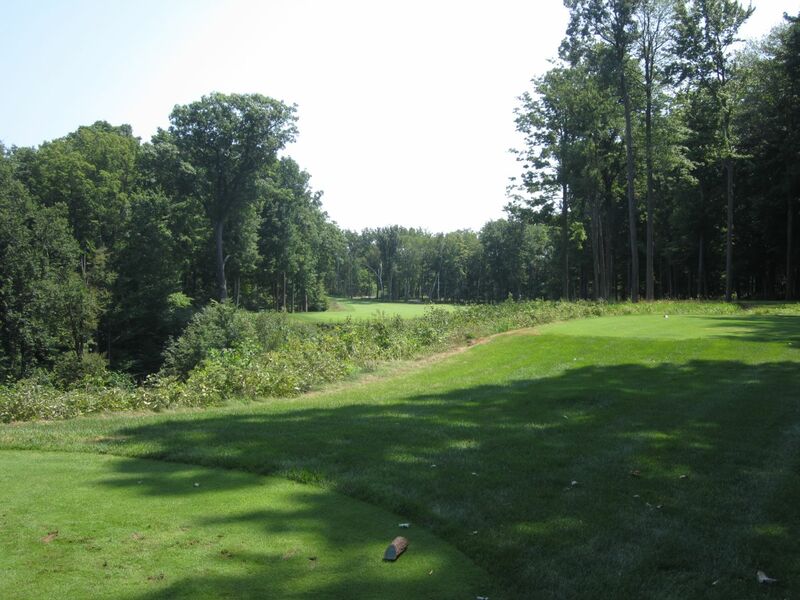 Narrow and through heavy woods, a 40-foot deep ravine resides on the left side of the fairway. The only safe place to be is in the fairway, and hitting driver should find all kinds of trouble. If you find the bend in the fairway, you will have a shot at the green in two, which is over the back-side of the ravine and directly left. The right side of the approach area funnels toward the green, so aim here and stay long, if anything, because short is dead. This is a phenomenal par four, with serious bite. 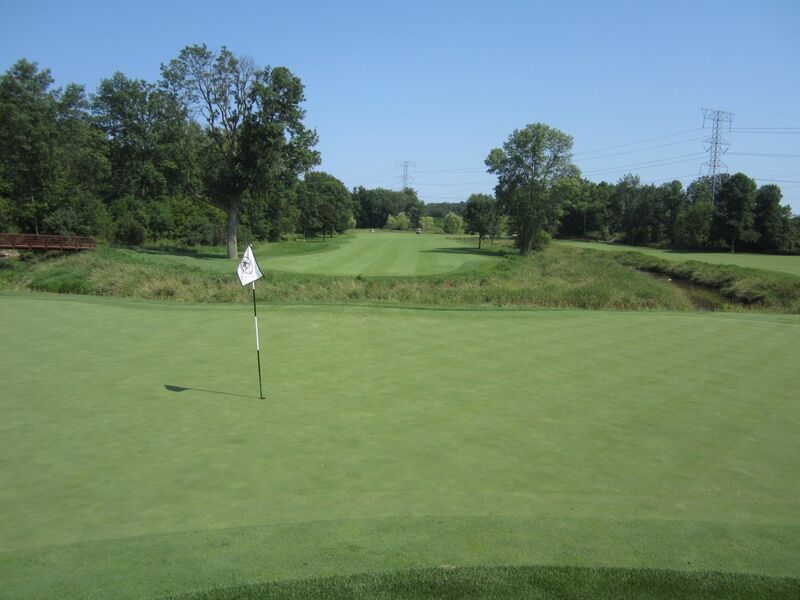 Following one of the best par fours in Wisconsin is one of the best par threes. The sixth hole tees up over a ravine and has woods all around. 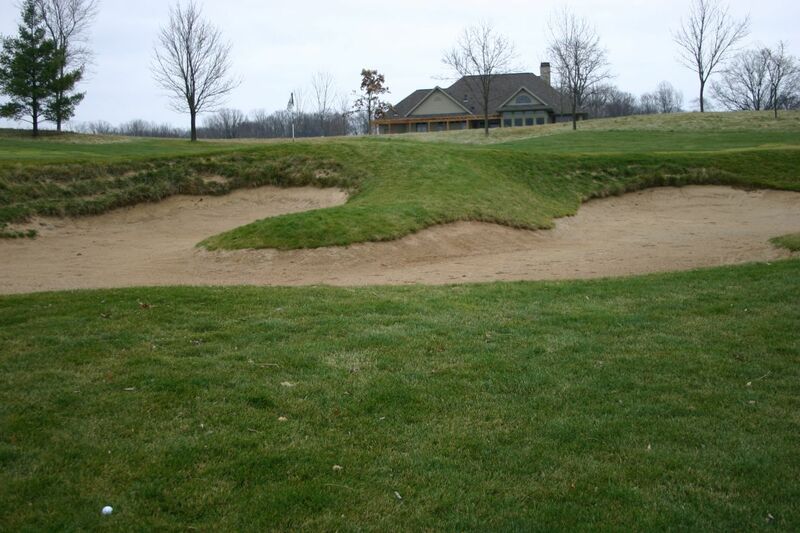 The front half of the green is surrounded by deep bunkers, and to the left seems to fall off the face of the earth. The back-right is the safest place to miss. The seventh is to me one of the most underrated holes at The Bull. Teeing up high above the ravine, the hole is short by Bull standards, but presents plenty of challenge. 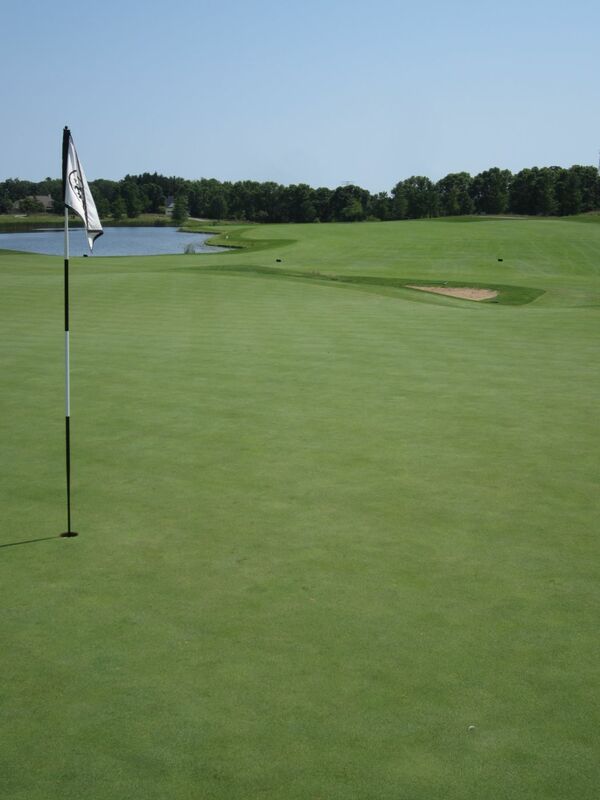 At under 300 yards, this green would take a miracle to hit from the tees. A mid-iron will set up perfectly to the fairway. 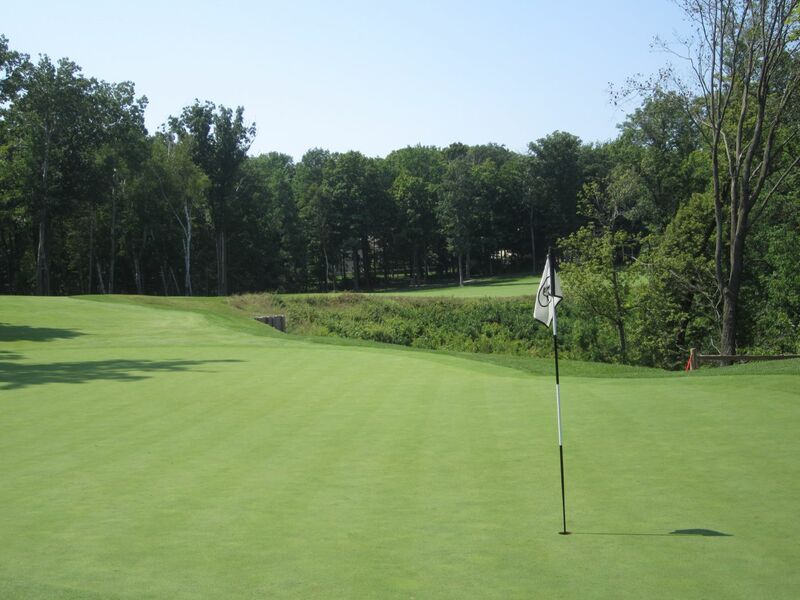 The approach is primarily blind over a tall pre-green mound, and the green is narrow, but long. A steep hill lines the left side of the green area, and can be used to carom the approach green-ward. Miss here if anything, as the right side is wet. 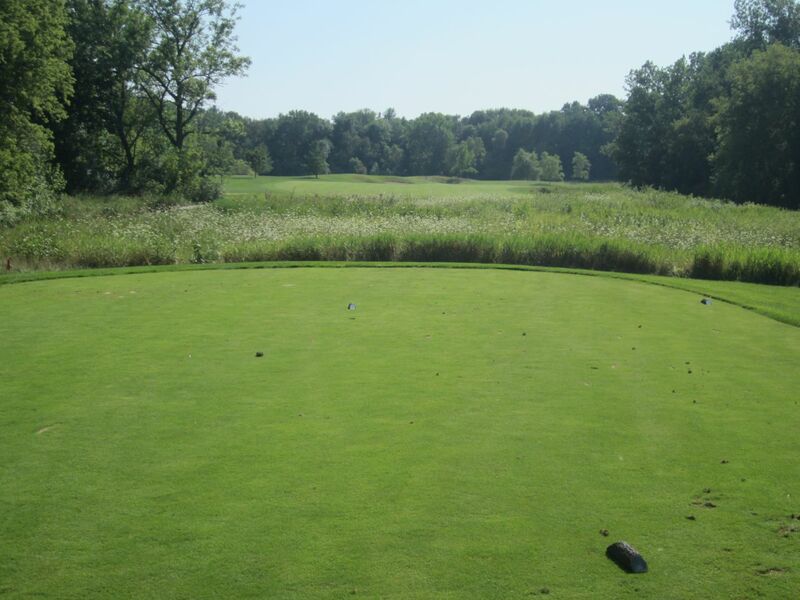 The eighth is my favorite par five at The Bull, and one of my all-time favorites in the state of Wisconsin. The Onion River winds through this hole, and splits the fairway at around 300 yards. I have heard claims that this green is reachable in two, but cannot imagine it. Which fairway should be chosen for the second shot? The left side allows for the best approach and most merciful margin of error, but the right side can leave a shorter approach. From the right side, the green is very narrow from front to back, and must be played over a rock wall that abuts the Onion River. A third bail-out fairway lies on the left side of the green, which can help if hitting short from the left. The eighth at The Bull is choose-your-own-adventure golfing at its very best. The finishing hole on the front nine is a long par four that plays mostly uphill. 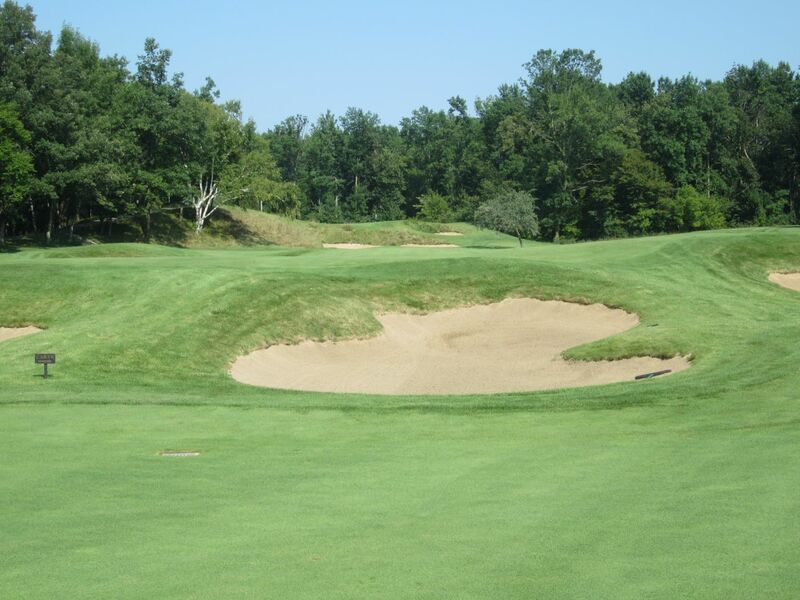 Stay right or long on the approach, as the green-side bunkers that front the left side of the green are treacherously deep and difficult to play from. 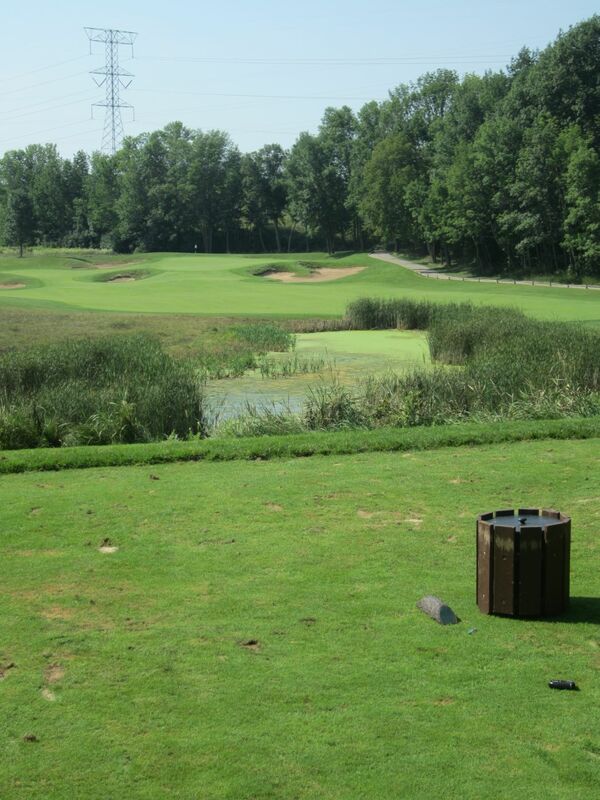 The tenth features one of the most highly elevated tee boxes on the course. A par four that bends slightly right, a straight drive is rewarded by avoiding the traps the lie on either side of the fairway. 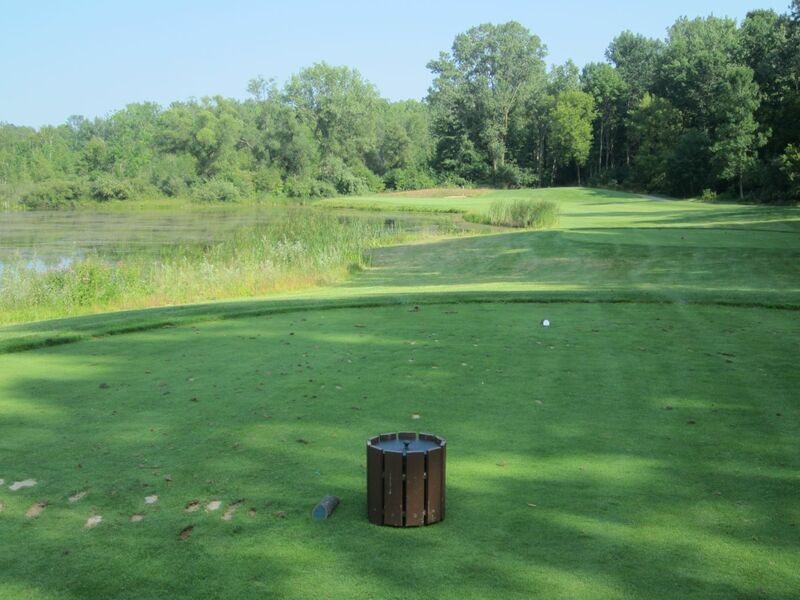 If all the choices on the eighth hole made you uncomfortable, wait until you encounter the tees on the eleventh! A huge inland pond makes the tee shot nerve-wrecking, with woods building a barrier on the far side of both fairways. Long hitters can try for the right side fairway, I am told, but I came up fruitless on all three of the junk balls I hit at it. In my defense, I think I tried cutting off too much of the fairway and made the distance unnecessarily longer than it needed to be. I am also probably not as long of a hitter as I like to think I am! A hybrid or fairway wood to the left side fairway presents the most realistic option, and should leave an approach from under 175 yards. The pond stays in play on the approach, as the green runs toward it and sand traps both long and short will catch errant shots. The twelfth is a fantastic par three. Highly elevated tee boxes make for a 210-plus yard tee shot to a green that is guarded both left and right by sand. I remember laying up on this hole the first time I played it, and thought yesterday that would be silly. A 4-hybrid put me in the deep bunker on the right side. I felt great about my sand shot until it rolled slowly past the pin and nestled several yards off the opposite side of the green. The green on twelve is slanted heavily downhill from the right to left side. When I mention The Bull has some of the best par fives in the state, thirteen is certainly one of them. Teeing up over water, the hole plays long and right-to-left. This hole is target golf at its best. 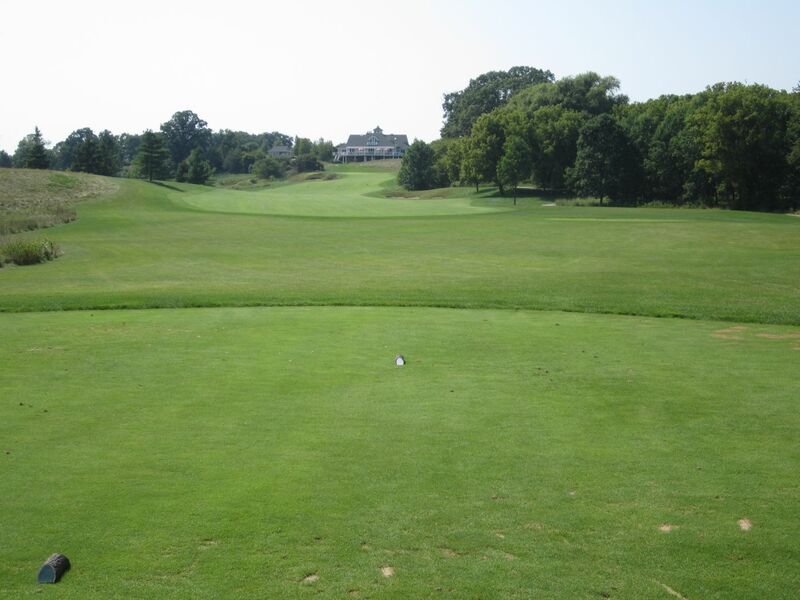 Find the fairway on the first two shots, and you will have a decent enough opportunity to hit the green in regulation. 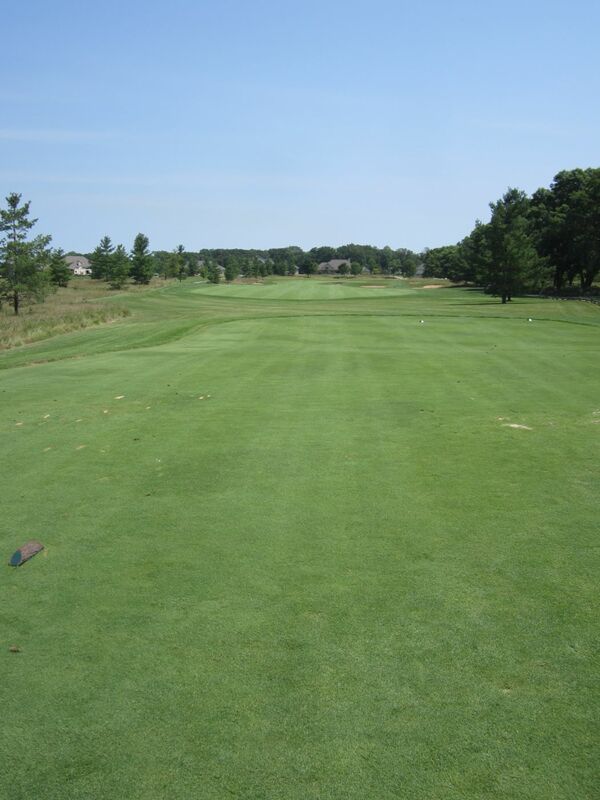 The third shot is primarily blind, uphill from the fairway over a wall of fescue. Fourteen is one of the most deceptive holes on the course. From the tee boxes, very little trouble can be seen. Upon driving to the fairway, though, water lies on both sides and long. The green area is absolutely gorgeous, with the Onion River rushing vigorously beyond. The fifteenth is a fairly short par three that rewards a drawn short iron. The pond left will take anything hit there, while a huge sand trap backs up the green. Bail-out is provided only by the fairway short and right. One of the hardest par fours anywhere, the sixteenth at The Bull has I’m sure spoiled many good rounds. The distance is manageable, but each shot needs to be perfect, and the distance on all shots can be quite confusing. Oh, and the green is minute and heavily guarded. The tee shot is uphill, and a draw with a fairway wood or hybrid plays nicely. It is important to reach the top of this hill, as anything less will leave a draw stance and make aiming the approach between the trees even more difficult. The approach here is possibly the most demanding in the state. 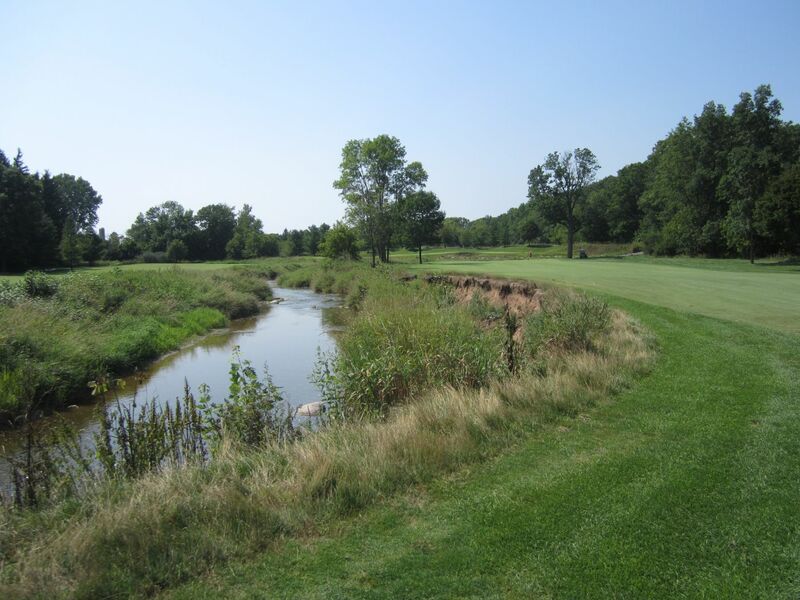 Between trees and over a deep ravine and stream, the green resides on the far side of some hellish sand traps, and slopes toward the back-right. As an aside (please feel free to skip): This is where my round got interesting. With 100 yards over the ravine to the green, I realized I no longer had my pitching wedge. I remembered leaning it against a tree on the fourteenth when I opted for my nine-iron, and figured 100 yards can be easily carried with a 56-degree wedge. I hit it cleanly, but found the front-side bunker. A shot to the fringe and one-putt left me with double-bogey. Having caught my first group of the day on the 17th tee, I figured it was an opportune time to head back for my lost club. I found it on fourteen, bypassed fifteen and thought to myself that I had plenty of time to replay sixteen. I changed to my third clean glove of the day, took a first practice swing and launched my 4-hybrid club about 50 yards into the woods. Instead of watching closely where it was going, I took off after it running off the tee box and in to the fescue and swampy area. After 20 minutes of searching, I found it about ten feet up in a tree, went back to the cart to get another club to lengthen my reach, and successfully retrieved it. I looked like I had just played a game of tackle football on a rainy Sunday afterwards and had successfully torn my pants and shirt – awesome. I replayed sixteen with a perfectly drawn 4-hybrid to the fairway, then again hit the front-side trap. I was thinking there must be something to this, so I took random shots with different clubs from different distances, and every time hit that sand trap. The conclusion I came up with is that this hole’s approach plays longer than it really is. The seventeenth is a very underrated par five. With a tee shot between trees, the fairway is wide open and runs downhill. The second shot affords a breathtaking downhill view, and allows for some real free-swinging. A litany of fairway traps make up much of the approach area, and the green is long and kidney shaped. Finish up on seventeen and make the short drive to eighteen. The club calls it “Rock-N-Roll.” “Sink-N-Swim” has always seemed more appropriate to me. 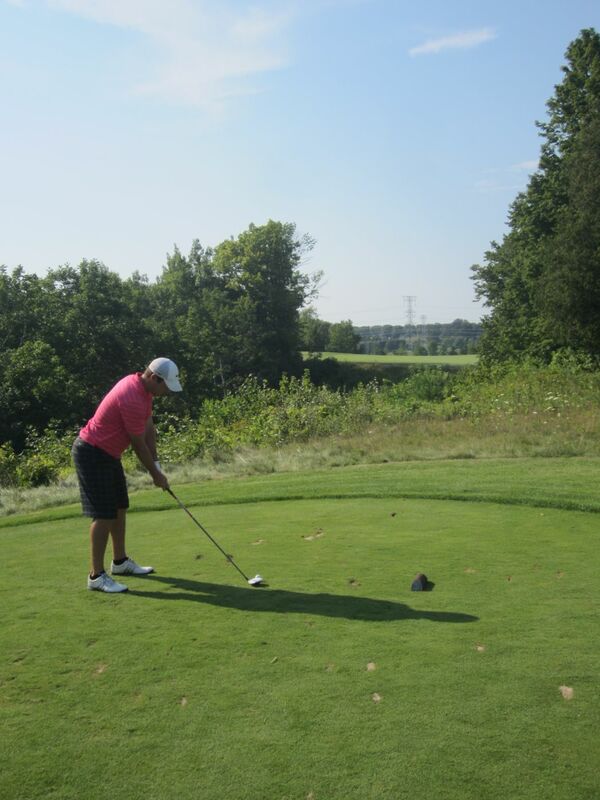 Detrimentally, my main swing thought here was to not let my driver slip out of my hand and fly in to the pond. I am not sure I would have chased in after it, but like to think I would. 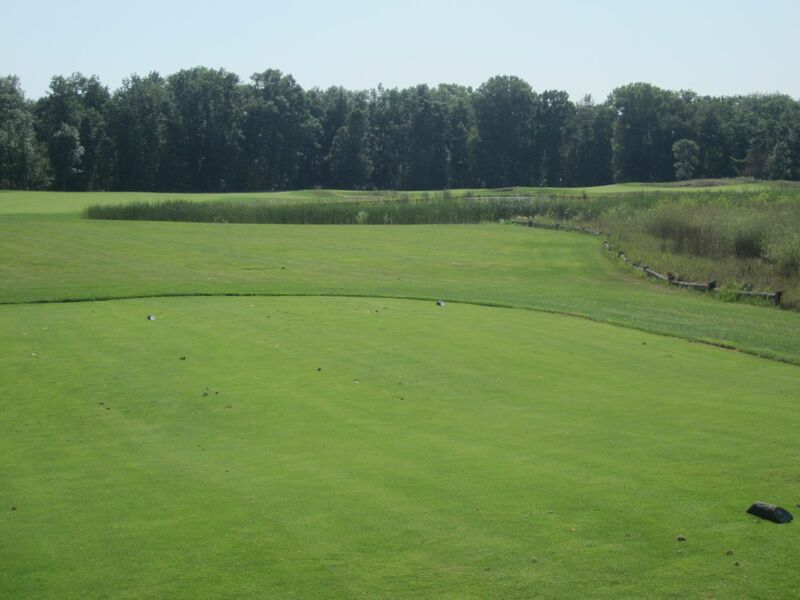 This is a very strong finishing hole, and the tee shot from the black and blue (fitting) tees can be well over 200-250 yards to carry the pond, which lengthens the farther left the drive is aimed. Find the fairway and prepare for a difficult approach. The right side falls off to wetlands, while the left side is fairly open. Favor the left side to avoid trouble, or use the hill beyond this green as a back-board for the approach. The Bull can be a very difficult course. If capable of hitting the ball straight, though, it is certainly fair. It rewards length and penalizes imprecision. The greens can run very quickly, but are readable and true. 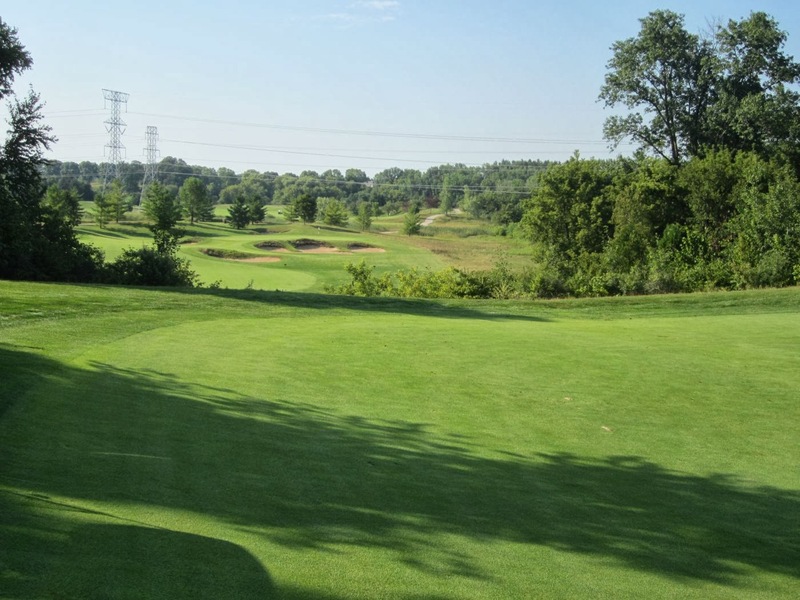 It offers choices on many of its holes, features fantastic variety, and certainly has the wow factor to make it one of Wisconsin’s very best golf courses. I recommend signing up for The Bull’s “50/50 Club.” I believe it was $50 at the beginning of the season, and included a free round [applicable for any tee time during the season] and weekly tee time promotions ($27.50 for my round on Saturday, for example, which included cart and range). While GolfNow rates are still at $55-90, this proved to be a great way to take advantage of an unseasonably warm November Saturday. The $145 mid-season rate is certainly intimidating, but keep your eyes pealed and you should certainly be able to find plenty of ways to play this gem of a track less expensively.